An original “New Electrobeam” record sleeve. To me, the records made in the 1920s and 1930s on labels like Gennett and Paramount (manufactured by the Starr Piano Company and the Wisconsin Chair Company, respectively) seem to be a part of Americana. They were distinctively American companies made in America’s heartland, and recorded a large amount of music by and for the American common man. While today’s record, though indeed a Gennett, is not one of those vernacular types, it is a “New Electrobeam” by an excellent New York dance band. Gennett 6506 was recorded June 18, 1928 in New York City by the New Yorkers, a Carl Fenton orchestra. The vocal refrains are by Carl Mathieu, who also sang as a member of the Peerless Quartet. “Carl Fenton” was, however, not a real person. Fenton began “life” in the early 1920s as a pseudonym for Gus Haenschen, an executive and studio band leader with Brunswick Records, whose name was “ill-suited” for record labels given attitudes toward Germans following World War I (plus, just look at it, it’s like a mess of letters). This “Carl Fenton” recorded for Brunswick between 1920 and 1927. In 1927, Reuben Greenberg, who had been a member of the band, bought the name from Haenschen and began using it to lead his own band, which recorded with Gennett and later had a pivotal role with the QRS label made by Cova around 1930. In 1932, Greenberg legally changed his name to Carl Fenton, thus bringing the fictional bandleader into reality. The band first plays a very nice syncopated version of “You’re a Real Sweetheart”, strangely credited to “Kahn-Fioritta”, even though the song was actually written by Irving Caesar and Cliff Friend. Vocalist Carl Mathieu seems to miss his cue a little bit on this side. 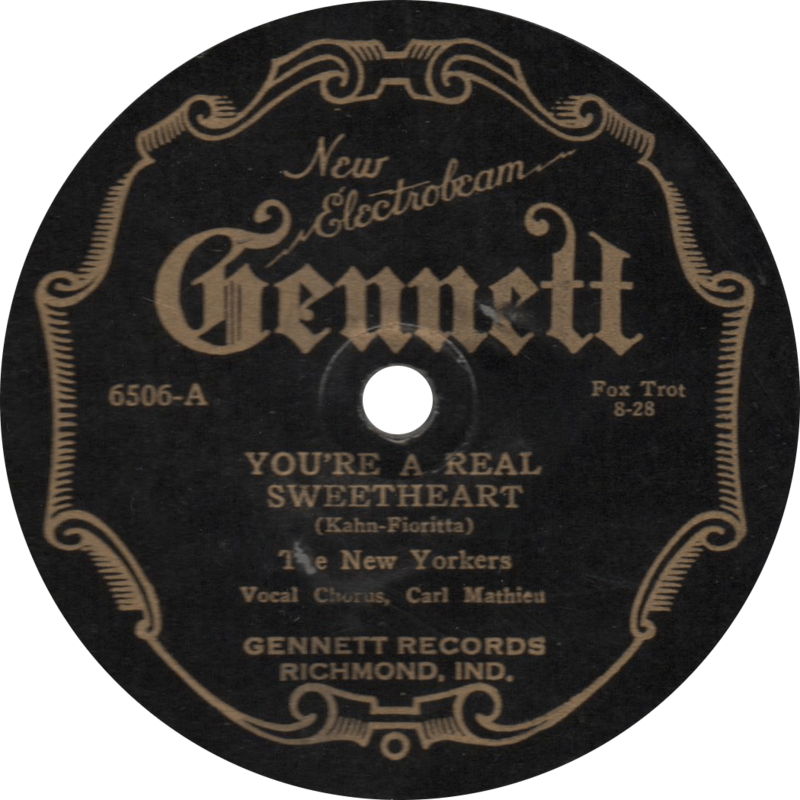 You’re a Real Sweetheart, recorded June 18, 1928 by The New Yorkers. 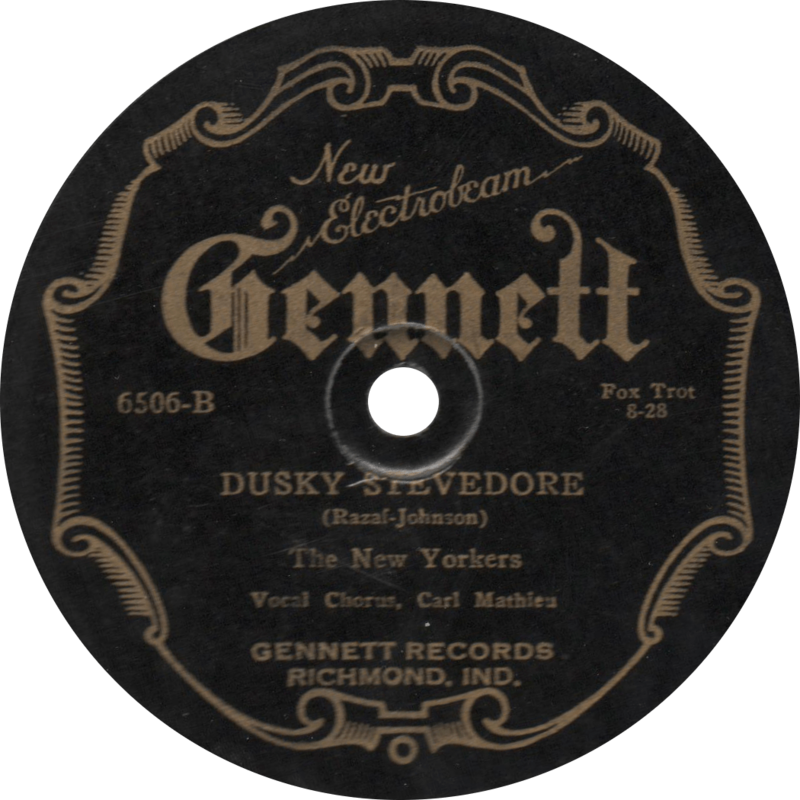 On the reverse, they play another great one, the 1928 hit “Dusky Stevedore”, this time correctly credited to Andy Razaf and J.C. Johnson. Dusky Stevedore, recorded June 18, 1928 by The New Yorkers. This entry was posted in Records and tagged 1920s, 1928, Andy Razaf, Carl Fenton, Carl Mathieu, Cliff Friend, Dance Band, Gennett, Irving Caesar, J.C. Johnson, Jazz, Starr Piano Co. by R. Connor Montgomery. Bookmark the permalink.